Extra Goody #4 - "Guest Art by Matthias Pflügner and Steffi Schütze!" The convenient thing about being an illustration or a virtual character is that you can be zapped from one place to another in the blink of an eye. Your form and texture can also be altered with very little effort on the part of those doing the altering. And the possibility you have of being in two places at the same time is easily understood by all - without discussions of Quantum Physics or multi-dimensions getting into the mix. 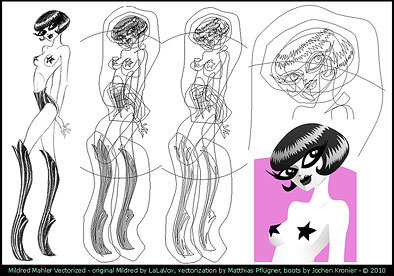 This is how it is possible for my creation, Mildred Mahler, to have been together with Matthias Pfluegner (aka Johnny "Mulholland" Fitz) in New York City day before yesterday wishing me (LaLaVox aka Laura Carleton) a Happy Birthday, while at the same time existing in glamorous vector realms created by the fabulous Steffi Schueltze, and replying to birthday greetings on my behalf over at FaceBook to boot. It must be quite a kick being so effortlessly multi-dimensional! 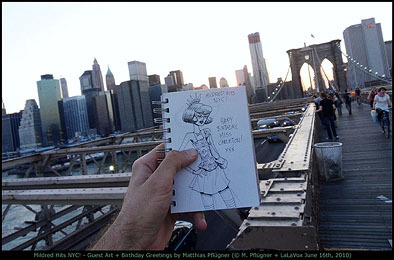 ...But speaking of birthdays: www.mildredlovesyou.com had a birthday of its own day before yesterday too. Unfortunately I was so busy attending to my own birthday that I failed to celebrate this in a timely fashion. I'm not sure exactly when MildredLovesYou.com actually came into existence - as it was only one page with a few images and the promise of things to come for the longest time. 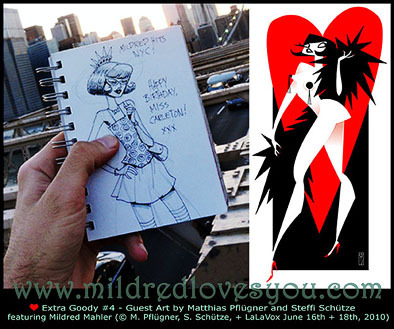 But I do know exactly when the first pin-up in the Mildred Loves Pin-Ups series (previously known as The Monday Pin-Up) began: on June 16th, 2008. Which means that the Mildred Loves Pin-Ups series just turned two day before yesterday.